Etihad Airways and Elenium, a leading provider of automation technology solutions, have announced plans to revolutionise the travel experience by taking facial recognition technology to new heights. The companies will demonstrate how a newly developed voice-activated self-service kiosk, bag drop and boarding gate facility will enhance the travel experience at Passenger Terminal Expo (PTE), taking place in London between March 26–28. Jorg Oppermann, vice president HUB and Midfield operations, Etihad Airways said: “With biometric installations increasing across airports globally, Etihad is recognising the growing demand to streamline not just the passenger verification process but to also decrease passenger queues and to increase operational efficiency. • Passengers check-in to their flight and register their biometric data on their mobile device before arriving at the airport, reducing queues at the airport. • Using AI, new baggage-drop terminals scan and memorise each suitcase placed on the belt and assign it to the guest reservation, removing the need for tagged luggage. • Using biometrics, passengers are identified and offered a personalised duty-free shopping experience through a voice interactive display, catered to the individual’s interests and needs, and also utilising floor space efficiently. • Customer Service Kiosks are available throughout the terminal to assist with airport information, provide ancillary opportunities, and because the kiosks are portable, disruption management. 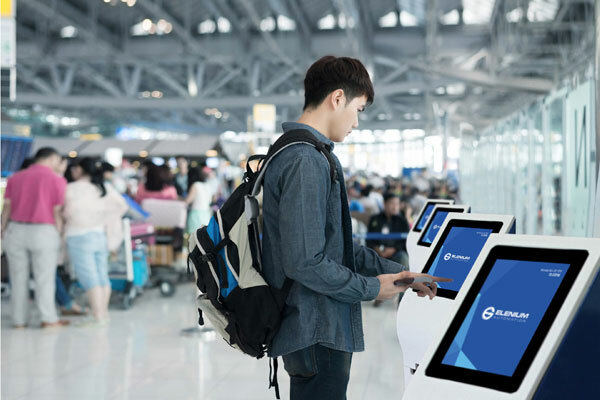 • Passengers will board their flight by walking through boarding channels which will automatically validate them without the need for a printed boarding pass - a faster, safer system. Etihad Airways will also white label the Elenium Voyager App which features booking management, passenger check-in, passport validation, Timatic AutoCheck, facial biometric enrolment, payment wallet, itinerary management (hotel, transfer, car etc.) and companion functions.